We said we’d finish the running with a bang, and we picked quite the race! A half-marathon that had a bonus 0.3 miles (so, a total of 13.4 miles or 21.6 kilometers), and around 2,000 ft (or 610 meters) of climbing. 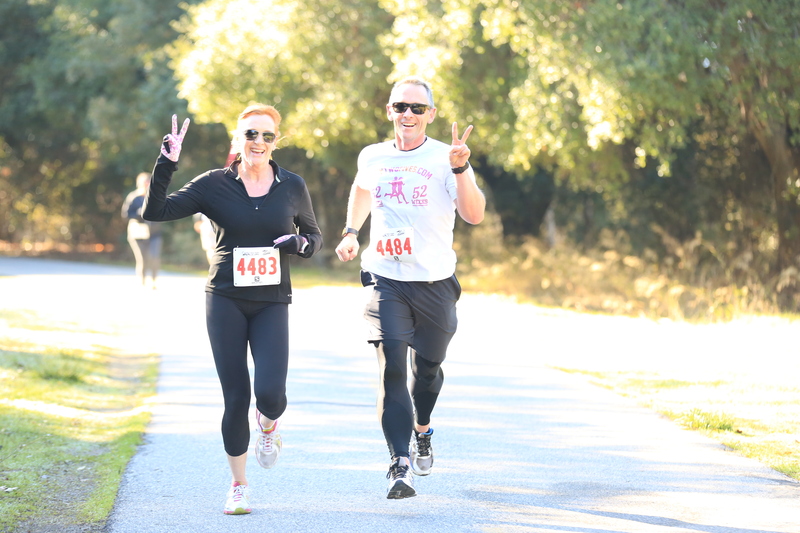 The race was at the Lake Chabot Regional Park, and was a counter-clockwise loop of the lake with a long detour through some of the most beautiful woods in Bay Area. It’s such a gorgeous run that the first few climbs — maybe even including the 600 feet in the third mile — didn’t hurt. I can’t quite say the same for the undulating terrain after the 10-mile mark: by then, my thighs were telling me they’d had enough climbing for one day! Come to think of it, maybe the first few miles didn’t hurt because it was *freezing*. It was near on freezing when we started, and the grass was crispy with a frost. My fingers were so cold in my thin running gloves that they hurt, and I didn’t feel my feet for at least five miles. Even crossing the finish line I was still layered-up with three layers of running gear on top. Still, these freezing days are some of the most beautiful — there was barely a cloud in the sky and barely a puff of wind. Gorgeous! While I’m whining, I should note that we should have trained harder for a half-marathon. It’s a decent step up from our diet of 10k races over the past few months, and came on the back of a quieter couple of weeks. Still, we made it, and 2 hours and 23 minutes isn’t too bad for a 13.4 miler with 2,000 feet of climbing! But, wow, was I stiff and sore for the next three days — if you saw some old guy hobling around, it may have been me. 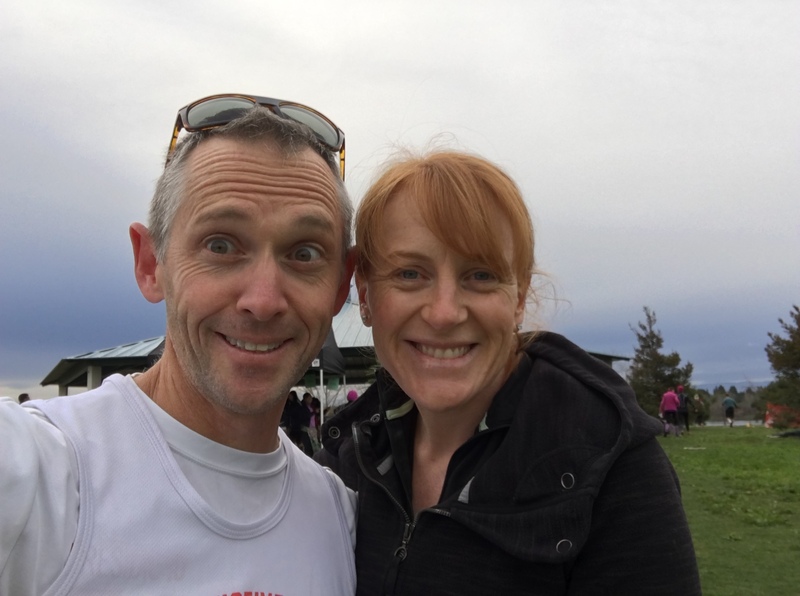 We decided that #51 would be the ZombieRunner Quarry Lakes 10k in Fremont, CA. This is the fourth or fifth time this year we’ve run a race organized by the Coastal Trail Runs folks, which made it an easy choice — they run nice, mid-sized races that are well-organized, have a great vibe, and also nice medals and shirts! It’s also the third time we’ve run at Quarry Lakes this year, including recently for Race #49 and also for Race #21. 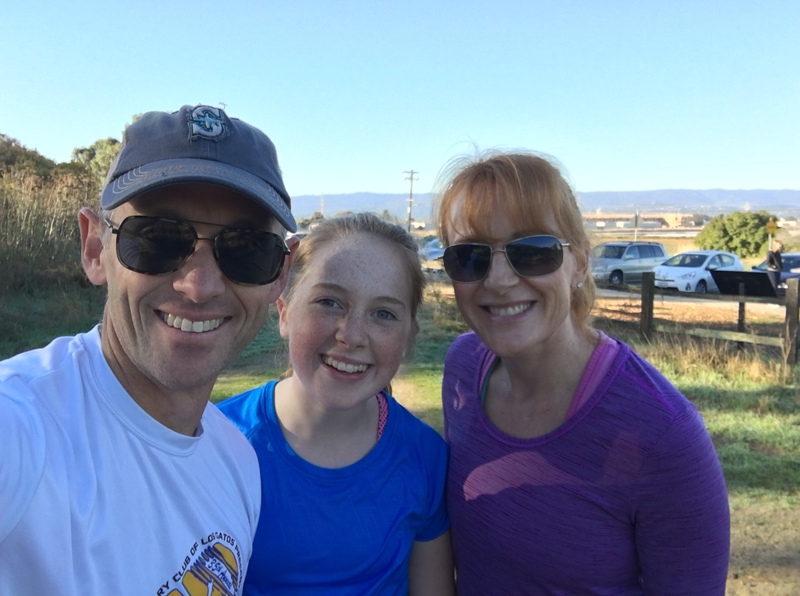 When you run 52 races in a year, there’s bound to be a few visits to the same locations (I’m also looking at you Hellyer Park and Vasona Lake). Anyway, this was a fine 10k race. We didn’t run it too hard, and finished in 48 minutes and change. 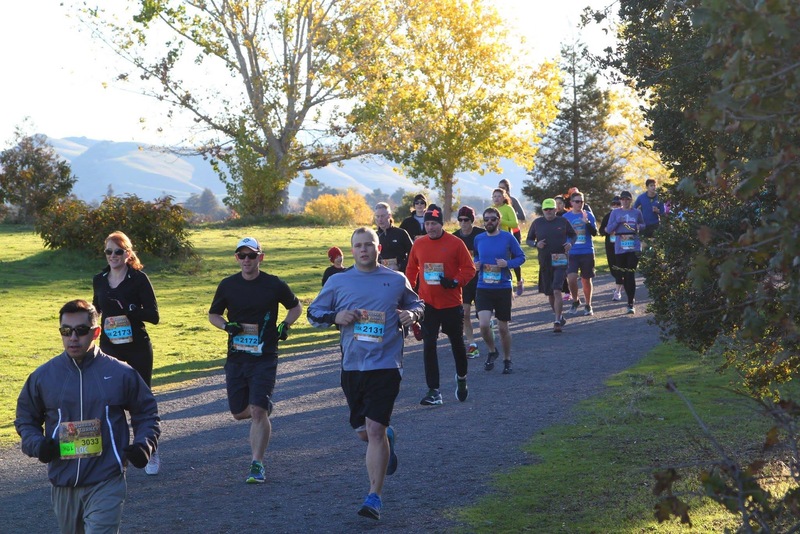 It was *cold* for California — probably just a few degrees above freezing at the start, and with a relatively stiff breeze off the lakes chilling everyone. The race itself was half on dirt trails (which I prefer) and half on asphault / pavement (which I don’t). But all of the race was pretty flat and friendly, and the scenery nice under any conditions. So, that’s 51 races done, and 51 race reports written. 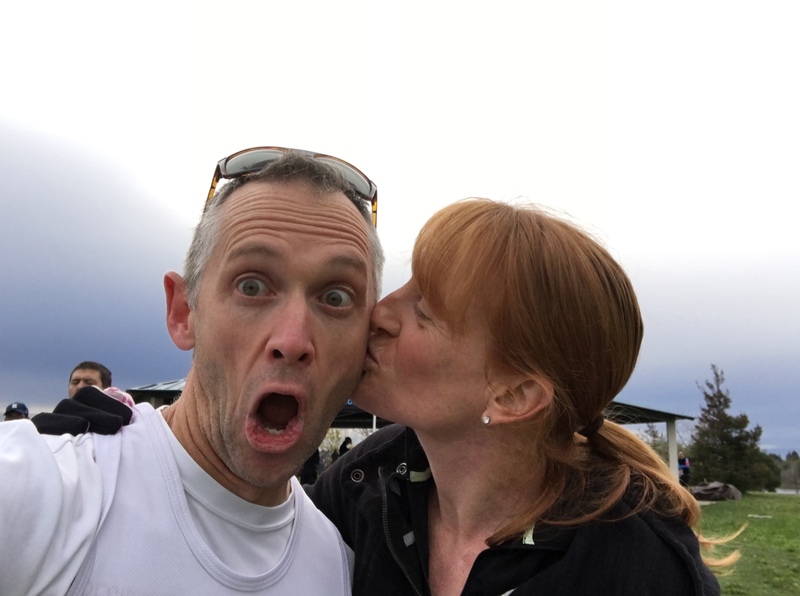 Just one more race, and one more race report for the year! If anyone is actually reading this, I appreciate you being along for the journey! Onward to the 52nd and final race! Anyway, yes, I was in Sydney last week. 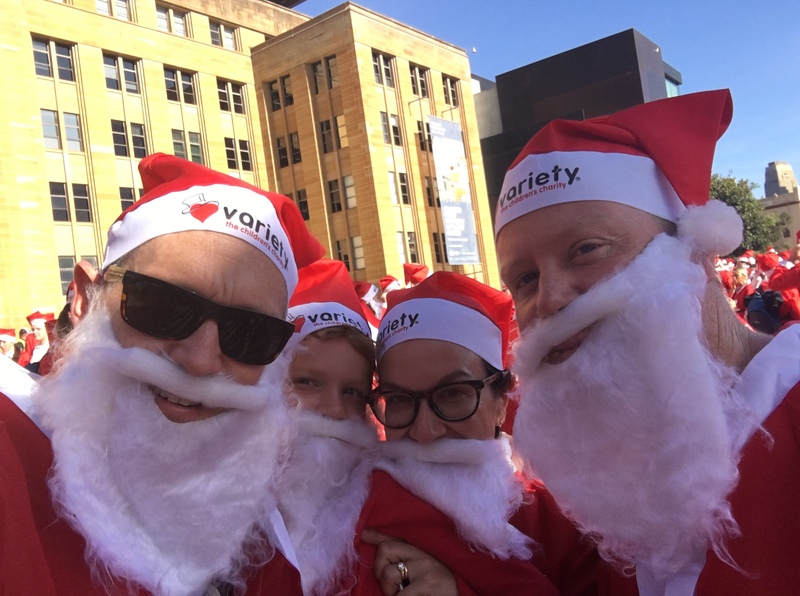 And so I dragged my brother, his wife, and their eldest son down to the SantaRun 5k. It was billed as a massive race, and 2,000 people showed up. 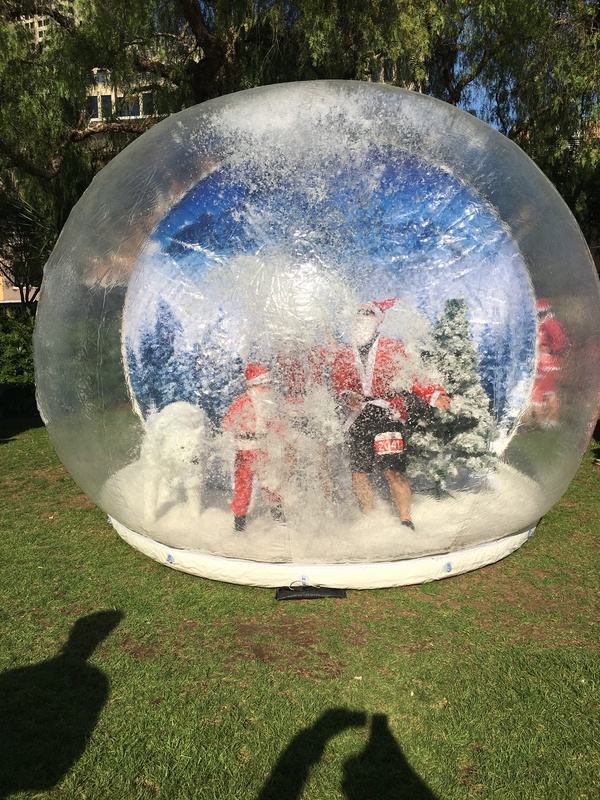 The novelty was they were all dressed as Santa — in the cheapest Santa suits ever made. Trust me, they were cheap — and polyester, and they made me sweat like I hadn’t in a long time. 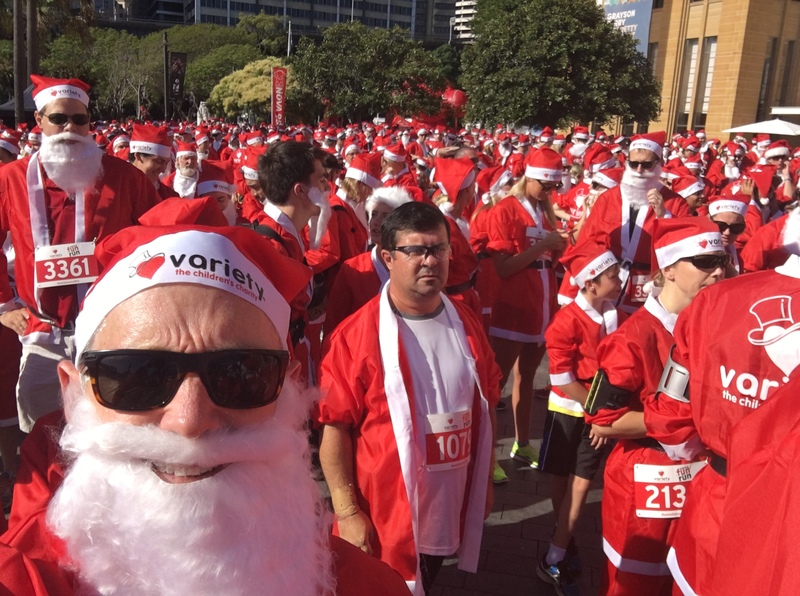 Mix Sydney’s warm summer weather with humidity and a santa suit, and you’ve got a recipe for smelly, hot running. We chugged along past the opera house, under the harbour bridge, and around the Rocks area. No land speed records were set, but we had a fun time as the photos show! Two races to go! 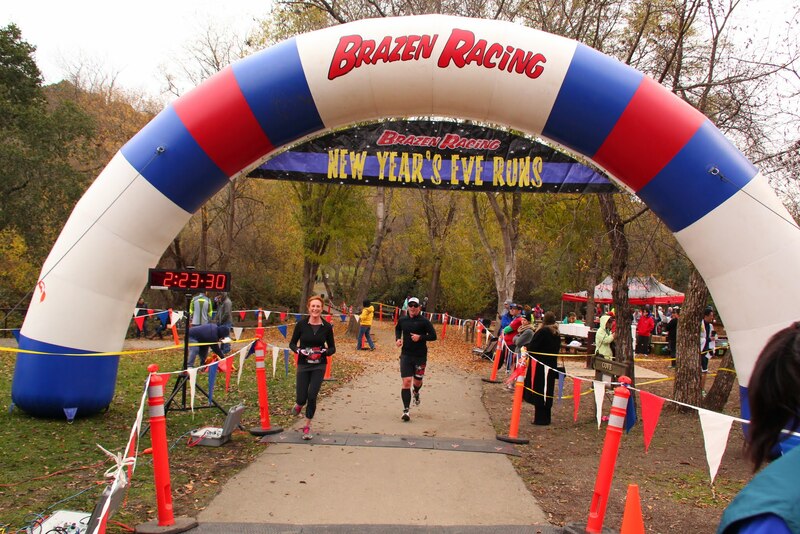 We ran on Thanksgiving, and decided to back it up two days later on Saturday at the Brazen Racing Quarry Turkey 10k. That’s 49 races this year, and just 3 more to go — and all in support of the GBS/CIDP Foundation. If you’re still not on board as a fundraising supporter, just head over here and make a donation. We took it a little slower in this race. It was freezing at the start, enough for me to pull on the running gloves. 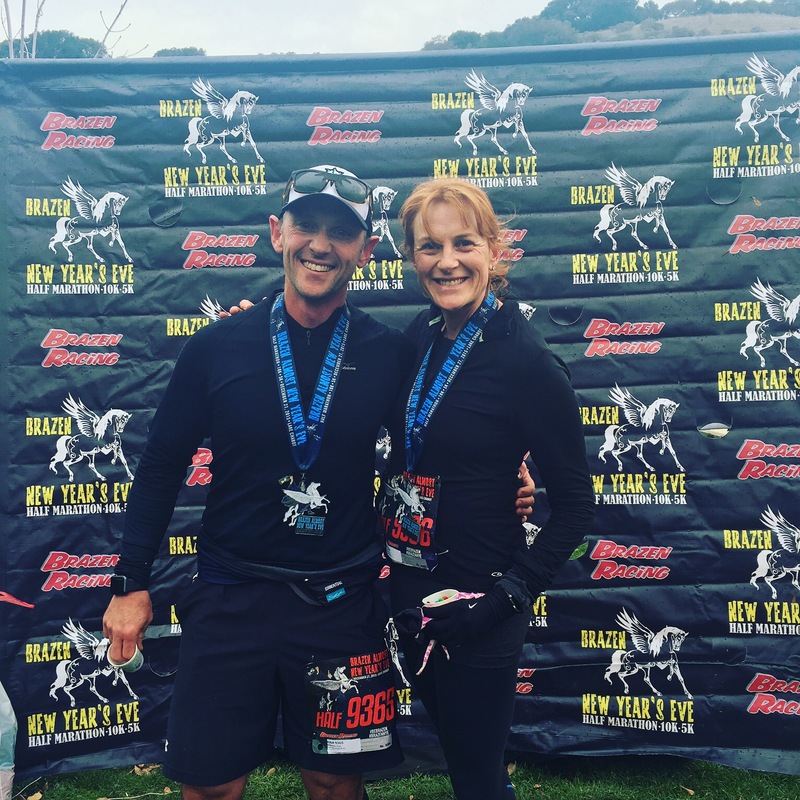 We sat on a pretty gentle pace until the last mile, and then picked it up and brought it home — some guy was racing me, and I decided he needed to be thrashed at the finish line. The race itself was at Quarry Lakes, a nice little park with a few lakes in Fremont, CA. We’ve run here once already this year in Race #21: The Zoom Quarry Lakes 5k. This time around there was probably five times as many people, and the parking lot was full. Brazen Racing is turning into quite a crowd puller indeed. Anyway, we’re both feeling great about being well-and-truly on track with the racing. It’s been a tough few weeks to get back on schedule, but 52 races is now within sight! There’s a monster 20,000+ Turkey Trot race on Thanksgiving in downtown San Jose. We ran it last year and, frankly, once per lifetime is plenty. 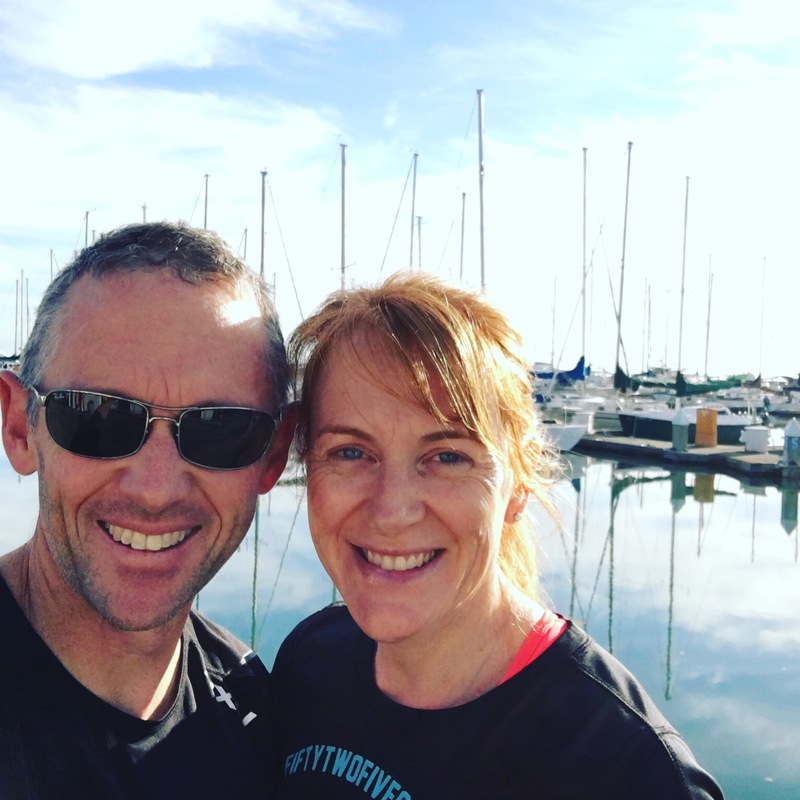 This year we ran the smaller Zoom Turkey Trot 10k and that’s more our cup of tea. Either way, It’s a good idea to go into calorie deficit on Thanksgiving! We didn’t talk too much about pacing before we started, and I decided to pick it up a little out of the gate. The 4th and 5th miles were a little tough as a result — but we still did a pretty nice time of just over 46 minutes. All up, a nice way to spend the morning! That’s race 48 done, and now there’s just 4 to go to reach our goal of 52 races this year! I was talking to friend the other day about interviewing candidates at tech companies: his thought was that you should sleep on your feedback on the candidate, rather than writing it up immediately. He’s found that he captures more nuances the next day. Interesting, I’ll give it a try. I look like I just got out of bed. Which I did. This may also be true with race reports. In hindsight, Race #31, the Awesome 80s race, was actually pretty crap. We paid way too much to get slightly lost on a bad course, though the costumes were amusing and they took one photo of me that i got for free. I still don’t understand why they didn’t do an out and back along the Brisbane Marina, rather than weave us in and out of a bunch of ugly office buildings. The good news is the Dolphin South End runners fixed all these problems for Race #47 last weekend. (Their motto: “Start Slow and Taper Off”.) Same start location, straight along the Brisbane Marina, turnaround, retrace steps, finish. Cost of entry for non-members: $5. Very mellow crowd of good people. Perfect! 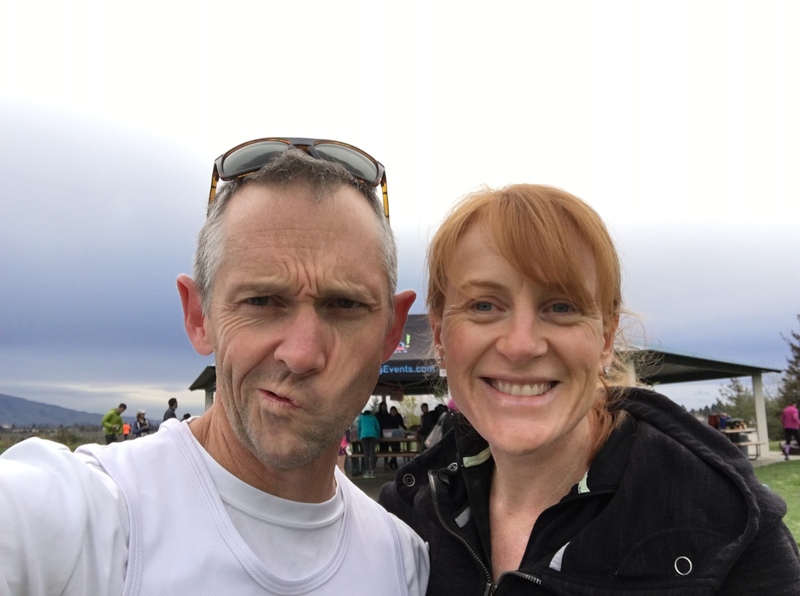 We did our usual warmup (walk to the start line), started at our usual pace (slow, the hamstrings were sore), deployed our usual tactics (get caught up in the racing, and speed up), and crossed the line in a blistering time (for an 8 year old kid). End results are over here. That, my friends, is Race #47 done and dusted. Only five to go, and then I’ll do something else with my weekends — but I plan to look back fondly, and feel really great about how we’ve helped out the GBS/CIDP Foundation international. If you want to donate, I’d sure appreciate it — we’ve still got around $7,000 to go in a month! 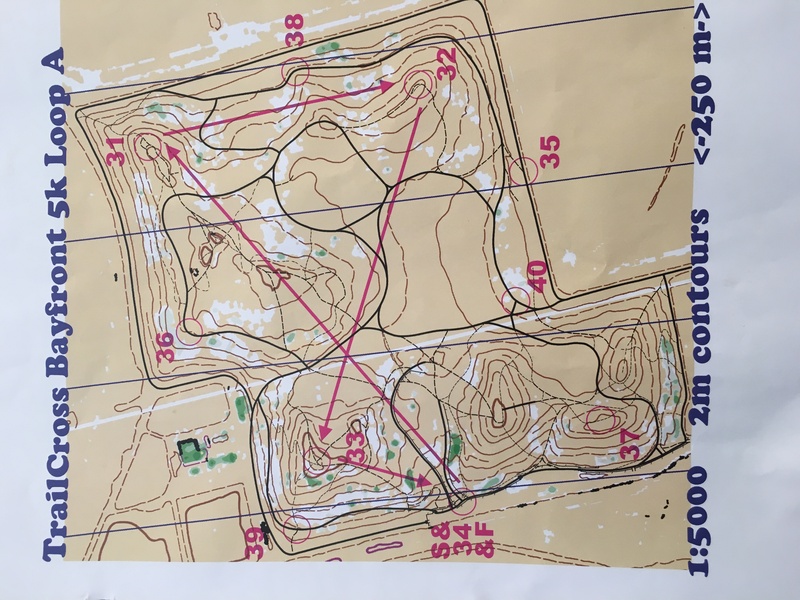 We tried something different this morning — orienteering blended with running in the form of trailcross. And it’s a fun challenge — and this race was well-organized by terraloco. We looked like amateurs. Well, we looked like road runners. We wore shorts and t-shirts. Lots of other folks had hiking boots, gaiters, compasses, fancy looking map holders, funky headbands that make you look like you know what you’re doing, and generally looked like pros. Anyway, it goes like this. Fifteen minutes before the start, you get a chip and a map. On the map are marked stations, and idea is you run them in the order shown on the map. You can take any path you like, and a straight line isn’t always the fastest way to get there. When you reach a station, you scan the chip on an e-punch device that’s mounted on a little windsock like thing. Once you’ve visited all the stations, you e-punch at the finish line. We had a fun race: Lucy and Selina both came along. We won the 5k race, though in fairness the field was small and most were doing the 10k. But we won — we were the first across the line, and therefore the first in the team category too! The prize was free entry to another race, and I’m looking forward to that. Well, that’s 46 races done. Can you believe there’s only 6 to go in this crazy year?